The game-winner came in the 70th minute on a play started by Derrick Etienne, Jr. (who entered in the 67th minute) coming down the left side. He fired a shot off a Toronto defender, and it went in the air into the box, where Bradley Wright-Phillips made a play on it, but the Toronto goalie swatted it away. 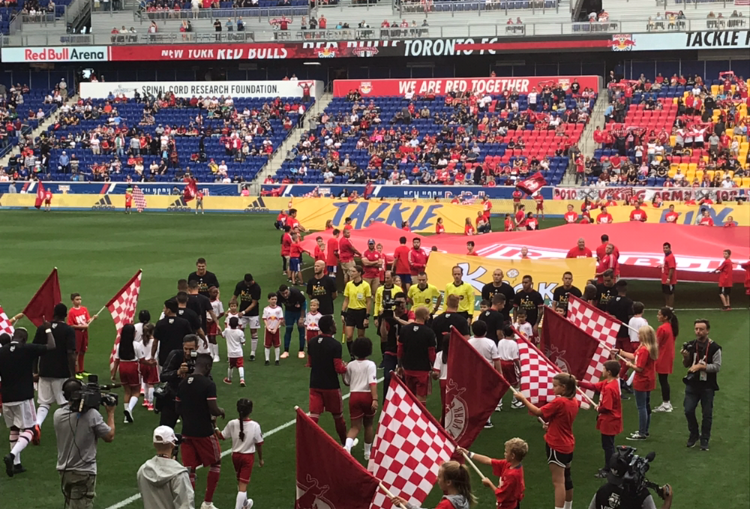 The ball ended up going to Kaku at the top of the box, and he fired a shot along the grass that slipped past the traffic and in to make it 1-0 Red Bulls. This was Kaku's fifth league goal, and all of them have been game winners. He has two goals in the last four matches. In extra time, Wright-Phillips lofted a ball over Toronto's Eriq Zavaleta for Etienne, Jr., and he chipped his shot over Toronto goalkeeper Alexander Bono to double the Red Bulls' lead. This was Etienne Jr.'s fourth goal of the season, and Wright-Phillips recorded his eighth league assist of the season, surpassing his previous best of seven set in 2015. Red Bulls Head Coach Chris Armas said of Etienne's goal, "Derrick, his confidence and what a goal means to any player, Derrick's human, we all know that he's got a number of good looks and he's put himself in those chances and because he's trained well and he earned that, he earned those minutes tonight. So we're all rooting for him when he's out there because he loves to score, he loves to play, he loves the club like no one else. So any time a player can get rewarded and give something to the team like that it's a thrill to Derrick." The one blemish on the night for the Red Bulls was when Wright-Phillips got a yellow card for arguing with the referee in the 86th minute. Due to card accumulation, he will miss their big match next Sunday against Atlanta United, a match that could determine who finishes first in the MLS and wins the Supporters' Shield. Armas said of the yellow card given to Wright-Phillips, "We all know it's a huge loss to begin with. Again, it's disappointing. We saw a dirty tackle, if you saw something that's going to keep him out almost worthwhile, maybe you can swallow it a little easier. So, again, it's, I don't think he gets that benefit of the doubt in these moments. Not when you see the them firsthand four straight years. And there's probably no better forward over the course of that time, you guys tell us the stats, 20 goals a year, there's no better -- and he's the most honest one of them all. He doesn't cheat the game ever. So can the referee manage it in a way -- the guy's frustrated, I understand it, can I hold off on the yellow card." With this win, the Red Bulls improved to 18-5-7, with 59 points, in second place in the Eastern Conference, four points behind Atlanta United. Atlanta also earned a 2-0 win on Saturday, over Real Salt Lake to improve to 19-6-5, with 63 points. The Red Bulls gained two points in the standings on New York City Football Club, who played to a 1-1 draw in Montreal. NYCFC is now 14-8-8, with 50 points. Red Bulls Captain and goalkeeper Luis Robles recorded four saves for his 11th clean sheet of the season. Robles sits second in MLS behind Sporting KC's Tim Melia's league-best 12. Robles' 11 clean sheets ties his career best. It is the third time in his career with 11 shutouts, also reaching the mark in 2013 and 2016. Robles moved into a tie with Tony Meola for eighth in league history with 97 wins. He also raised his career clean sheet total to 60.